What Are the Best Free Things to Do in CT This Weekend? One of the best aspects of visiting the state of Connecticut is the wide array of activities and attractions available that don’t cost a dime! Even in stately Greenwich, the town so known for its historic mansions and elite crowd, there are plenty of budget-friendly ways to spend your time. Whether you’d rather have an afternoon picnic in one of the area’s public parks or go window shopping along Greenwich Ave., you’ll have a wonderful time escaping the hustle and bustle of everyday life! Here are some of the best free things to do in CT this weekend. Before packing your bags for our great state, make sure you have an itinerary planned! For a complete list of our favorite free things to do in CT this weekend, download our free Greenwich Vacation Guide! In addition to the best budget-friendly things to do, it lists our top dining, shopping, and adventuring recommendations! If you need a quick weekend getaway from fast-paced New York City, staying in Greenwich and exploring some of the nearby small towns can be a great way to spend a few days! This area boasts historic details, stunning scenery, and plenty of Old-World charm. This weekend, why not check out the Avon Theatre in Stamford, CT or the Philip Johnson Glass House in New Canaan, CT? These are just a few of the best towns near Greenwich! If you’re escaping the city for some much-needed fresh air, you’re in luck. The city of Greenwich has no shortage of green spaces! One particularly picnic-ready spot is Binney Park. This spot is perfect for taking a romantic stroll with that special someone or simply watching birds from the gazebo. If you’re feeling a little more adventurous, Mianus River Park is a very popular destination for hikers, joggers, and outdoor enthusiasts. Strolling through one of our parks is one of the most romantic things to do in CT this weekend, so why not make it a date? Window shopping is one of the most popular free things to do in Greenwich. Most window shopping takes place along Greenwich Ave., a high-end strip that is often compared to the shopping available in Manhattan. Even if you choose not to buy anything, strolling around and seeing the sights can be fun and rewarding! Some of the stores located on Greenwich Ave. include Rag & Bone, J. Crew, Madewell, Tory Burch, and The Apple Store. If you or your family enjoy encountering the wonders of nature, the Audubon Center in Greenwich is a great place to visit! This wildlife preserve places an emphasis on native birds and offers many educational outreach programs. During a visit, be sure to explore the center’s seven miles of hiking trails nestled within beautiful hardwood forests. If you’re in the mood for something educational but prefer to stay indoors, check out the variety of free museums in CT. Experience the Best Free Things to Do in CT This Weekend! It’s true what they say: The best things in life are free! That’s why there’s no better time to escape to a place where relaxation is easy to achieve. Don’t let your budget stop you from treating yourself to peace of mind! There are so many free things to do in CT this weekend, and Greenwich is the perfect place to start. Need a place to stay in centrally-located Greenwich? Historic Stanton House Inn is located in the heart of town, close to everything the area has to offer. After a day of exploring quaint towns and enjoying the fresh air, come back to the comfort and luxury of one of our guest suites! 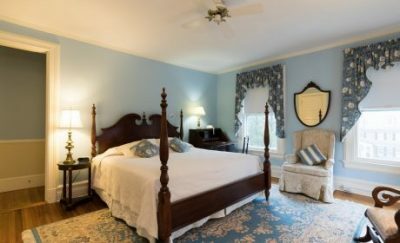 Our accommodations feature Victorian-inspired decor and dreamy details like clawfoot tubs, cozy fireplaces, and tranquil views. You’ll feel so pampered, you won’t want to leave! There’s no time like the present to get away from it all. Check our availability today and start looking forward to that last-minute weekend getaway!